For many people, getting stuck at a red light is a lot like getting sucked toward a black hole. Time seems to slow down, either because the person behind the wheel thinks the light is taking too long to change, or because they think they now have an endless amount of time to send a text, sip a beverage, or generally ignore what’s going on in front of them. Audi is using technology to give drivers a bit more clarity. The German automaker’s traffic light information (or TLI, for short) system allows cars to “talk” to traffic lights, giving the driver a countdown to a green light. 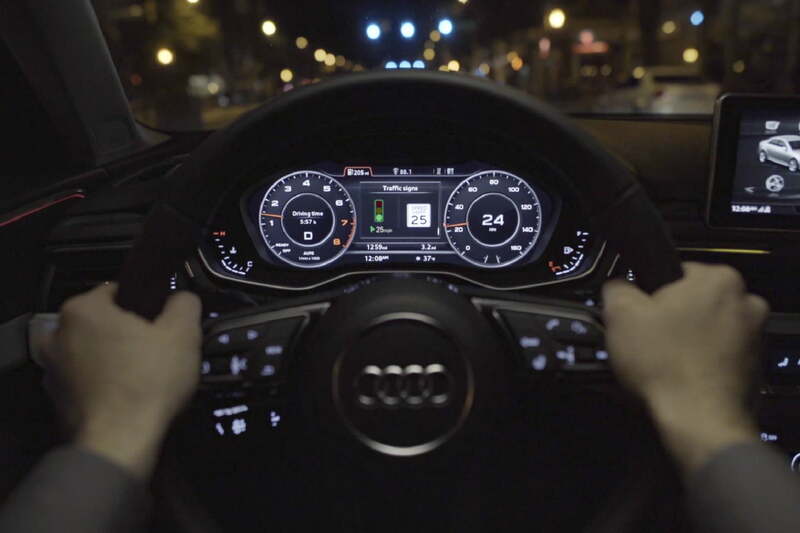 It’s a relatively simple feature that Audi said was designed to reduce driver stress, but the technology behind it could change the automotive landscape. But does this tech work today, in the real world? To find out, we grabbed the key fob of a 2019 Audi A8 and spent a few days motoring around one of the handful of United States cities where TLI is up and running. Red lights are usually the bane of drivers, but we sought out as many as we could find to give the system a full evaluation. The system is a form of vehicle-to-infrastructure (V2I) communication. As the name suggests, this consists of adding equipment to vehicles and related infrastructure that allows them to transmit and receive messages. Anything equipped for V2I can send and receive data such as the location of a moving vehicle or, in the case of Audi’s system, the status of traffic lights. Similar systems exist to allow vehicles to communicate directly with each other. This is known as vehicle-to-vehicle communication, or V2V. Both V2V and V2I are sometimes collectively referred to as V2X (vehicle-to-everything). The basic concept is the same in all cases. This type of technology has been discussed for years as a way to improve safety and offer new services to drivers. Panasonic is testing out how the tech can improve safety at intersections in Denver, while Ford believes car-to-car communication could eventually eliminate the need for traffic lights and stop signs. In addition to being in the right geographic area, we needed the right car, and the right conditions, to get the benefit of TLI. Implementation has been fairly slow, however. Some automakers, like Cadillac and Mercedes-Benz, have preemptively equipped cars for V2X, without any real plan as to how to use the technology. 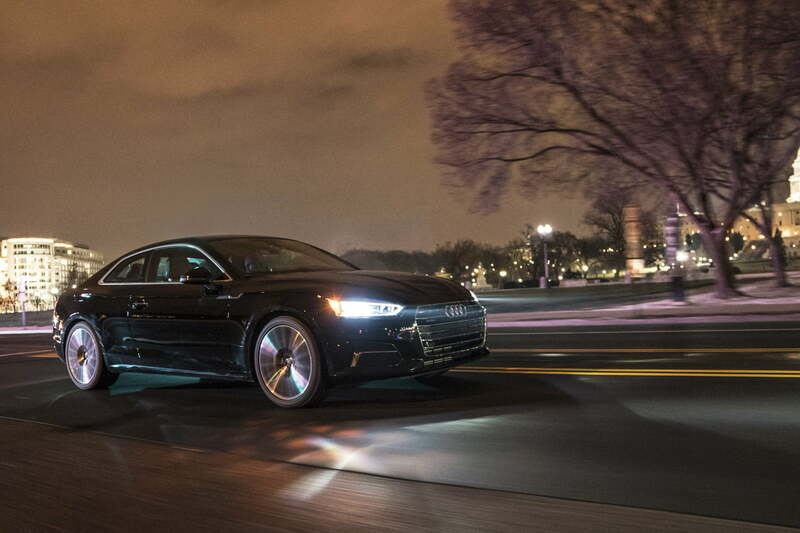 Audi is the only automaker to use V2V/V2I/V2X to build new features for its customers. In addition to TLI, Audi offers an integrated toll transponder on certain models based on the same tech. V2I is the pipeline but, as is often the case with new tech, data is the oil. Audi partners with a third-party vendor called Traffic Technology Services (TTS) to get the data to predict when traffic lights will change. TTS works with municipalities to gain access to the data from traffic-control systems. It then uses that data and machine learning processes to predict upcoming traffic lights. Cities still have to grant access to their traffic-light data, though. TTS takes the lead on this, although it sometimes uses Audi and other customers to “lobby for strategic locations,” a TTS spokesperson told Digital Trends. 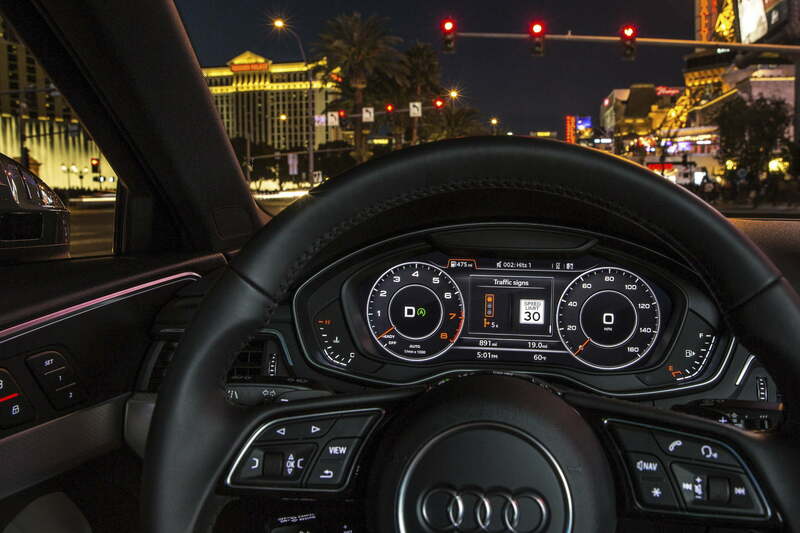 TLI launched in 2016, and Audi claims it now works at more than 4,700 U.S. intersections in 13 municipalities including Los Angeles, Las Vegas, and Washington, D.C. Audi also recently added a feature – called green light optimized speed advisory (GLOSA) – that tells drivers the precise speed to catch the next green light. Audi is still a long way from full nationwide coverage, though. In addition to being in the right geographic area, we needed the right car, and the right conditions, to get the benefit of TLI. The system is available on all 2019 Audi models except the A3, TT, and R8, as well as certain vehicles from model years 2018 (A4, A5, Q5/SQ5, and Q7) and 2017 (A4 and Q7). 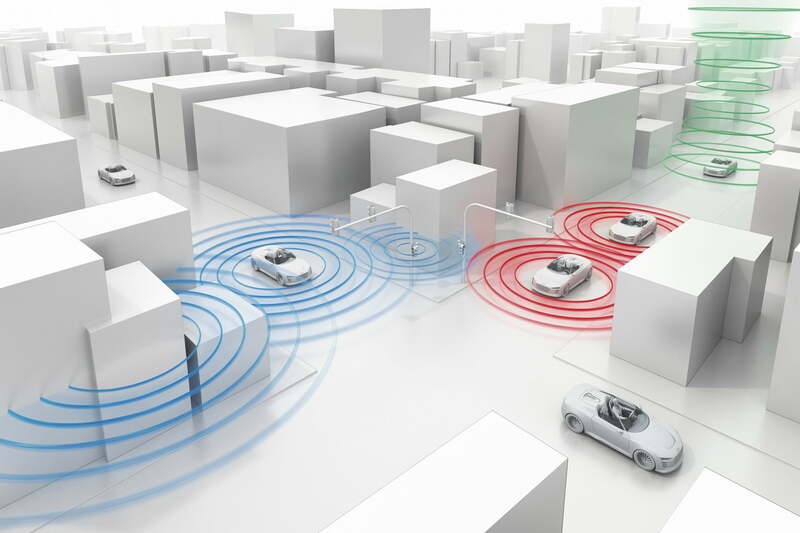 TLI requires an Audi Connect Prime telematics subscription. A six-month trial is included with new cars, but after that Audi charges $199 for six months, or $499 for 18 months. Granted, that rate also buys features like real-time traffic and fuel price information, Google Earth connectivity, and Google voice search. Audi wants drivers to pay attention to their surroundings when it’s time to move, not to a timer on their dashboards. 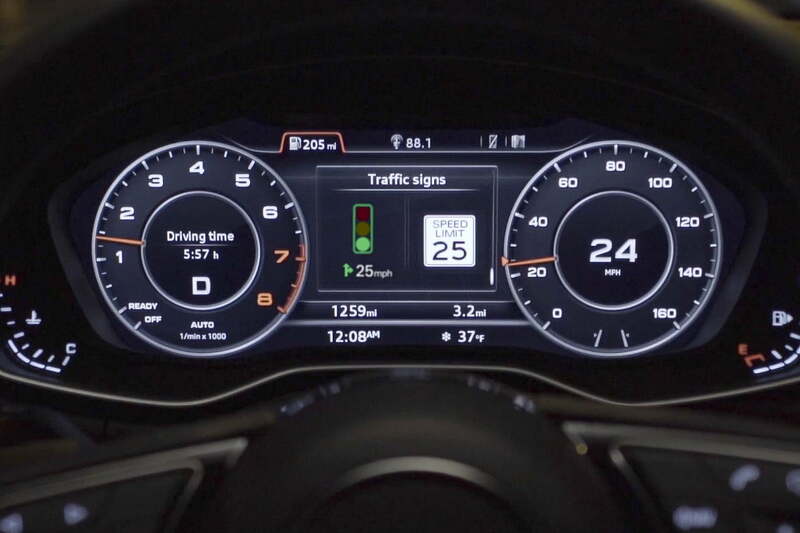 The owner’s manual of our 2019 Audi A8 test car also noted that TLI is “subject to certain system limitations.” The system may not work if the driver is exceeding the speed limit, or if the next traffic light is less than 100 feet away, the manual said. Data infrastructure must also be in tip-top shape. Cybersecurity issues, like a ransomware attack that knocked out Colorado Department of Transportation facilities, could impact the system (Audi claims that it doesn’t collect customer data), as could unpredictable events like traffic crashes or severe weather, according to a TTS spokesperson. In Texas, mice “created several outages” at certain locations, the spokesperson said. With all of that in mind, we slid into the cushy, leather-upholstered driver’s seat of our A8 test car, and pointed the luxury sedan toward the nearest traffic light. We tested the system in White Plains, New York, a suburb of New York City about 25 miles from Manhattan. TLI isn’t live in the Big Apple itself, but we still had more than 80 connected intersections to play with. Roll up to one of those intersections, and a picture of a traffic light appears right in the middle of the Virtual Cockpit digital gauge cluster, with a timer counting down to green. The first thing we noticed was that the countdown to a green light doesn’t actually go all the way to zero. This is by design: Audi wants drivers to pay attention to their surroundings when it’s time to move, not to a timer on their dashboards. The automaker noted that TLI is only meant to provide information, and that drivers must remain alert at all times. The countdown is designed to stop at around five seconds before the light goes green, but we found some variance, with the interval between the end of the countdown and the green light sometimes as long as eight seconds. V2X has the potential to make roads safer, and make life more convenient for drivers. That’s assuming TLI can even figure out that the car is stopped at a light. We recorded results for 114 red lights. The system was able to give us a countdown for 49 of them, but it also missed 47. In some cases, TLI would read a traffic light and then fail to recognize the same light a few minutes later. Sometimes it jumped the gun, indicating a light was red when it was still green (five times) or vice versa (eight times). In five cases, the system wasn’t able to establish a target lock on the traffic light long enough to start a countdown. It wasn’t a complete fail, though. TLI was able to identify some red lights even when there wasn’t a direct line of sight, giving us an advance warning to slow down for something we couldn’t see with our own eyes. It was also able to give us a speed recommendation to catch green lights 26 times. In all cases, the recommendation was to drive at the posted speed limit. If more cars had that feature, it could help keep traffic flowing. Drivers wouldn’t have to timidly ease into intersections fearing that the light will change. We found TLI to be too inconsistent, however. Instead of guessing when a light would change, we often had to guess how the system would react when we approached an intersection. Even this less-than-perfect level of performance requires a significant investment in connected traffic lights, as well as cooperation between Audi, service provider TTS, and the governments of cities like White Plains. It shows the challenges companies face as they push for more connected cars and infrastructure. Green light to a more connected future? Audi wants its cars to keep talking. The automaker may eventually integrate traffic-light information with navigation systems, or even engine start-stop systems. Other companies are jumping on the bandwagon, too. Ford plans to install a version of V2X in every new vehicle it sells in the U.S. by 2022. The tech could also be applied to self-driving cars: Aptiv and Lyft already use it in Las Vegas to tell prototype self-driving cars when a light is going green. Based on our experience with TLI, though, it seems V2X is still a work in progress. It only works in certain cities, only in new luxury cars from one brand with paid data subscriptions, and our test drive showed it to be less than reliable. Expanding use of this tech requires costly investments by automakers and city governments in hardware and data infrastructure, as well as coordination to ensure everything works the same everywhere, regardless of make or model. V2X has the potential to make roads safer, and make life more convenient for drivers. But unlocking that potential will require a lot more patience than it takes to wait out a red light.